The lawyer knew the Law (at least he could quote it), but he missed its essence: love. He also overlooked a few other things. He failed to love his neighbors. (Judging them was more his style.) He didn’t recognize that Jesus was the God he was to love. And He had no idea that Jesus would soon display on a cross God’s love for us. Six hours on the cross. Seven times Jesus speaks. Six long hours and less than 50 words, but what words, for these words reveal His love. Three times Jesus’ words show His love for the “neighbors” surrounding the cross; three times His words show His love for God. And the seventh time? Those words reveal His love for us. He forgives for the soldiers who pound in the nails – Father, forgive them, for they do not know what they are doing. He brings joy to a repentant criminal – Today you will be with me in paradise. He lovingly provides care for His mother, telling Mary, Behold your son! and telling John, Behold your mother! Jesus is living out the same commandment God gives to us all: love your neighbor as yourself. Who are our neighbors? The people around us. Who was around Jesus? Some soldiers, two thieves, His mother and a friend. John 14:15 If you love Me [Jesus], you will keep My commandments. John 15:10 If you keep My commandments, you will abide in My love; just as I have kept My Father’s commandments, and abide in His love. Three times Jesus lives out the commandment to love God. He does so through His obedience to His Father’s will. Jesus says to the onlookers: I am thirsty. And so fulfills God’s prophecy in Psalm 69:21. He announces to all present: It is finished. And so completes what He agreed to in Gethsemane. Then He speaks again to the Father, voicing final words of trust: Father, into Thy hands I commit My spirit. And before He breathes His last, Jesus commits Himself to the Father He loves. 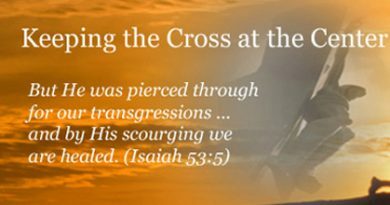 Jesus’ single question from the cross, My God, My God, why have you forsaken me?, reveals the whole purpose of the cross. He asked His question so that we never have to ask that same question. Believers never have to say “My God, my God, why have you forsaken me?” What happened to Jesus won’t ever happen to us; it happened to Him instead of to us. We need have no fear of losing our connection with God. Jesus is forsaken to ensure that we will never be forsaken. Savor what this means. God is assuring us that He will never let us wander so far that our connection with Him disappears. He’s also assuring us that nothing we do will ever make Him distance from us. Without Jesus’ real death on that real cross, we would have no such assurance. But because of the cross – because of God’s love in action – we are secure in His unceasing presence. Do you ever fear that God will distance from you? Do you ever fear that you have walked away too far for God to forgive you? Have you ever savored the safety of belonging to a God who expressed His love for you from a cross?